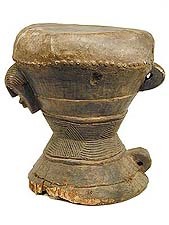 The Songye objects below have been sold and are left here for reference and educational purposes. Male Bukishi associations, clouded in secrecy, yielded political and mystical power revealed through Kifwebe (singular) and Bifwebe (plural) masks. Female masks, primarily white, are restrained and elegant with striated surfaces. Their function was to awaken and honor benevolent spirits. Male masks, known for their distinctive exaggerated forms, are also well represented. Aggressively formed with bulging eyes, projecting mouths and powerful crests, the masks of elders embody the greatest potential and strength. The dynamic forms symbolize the level of power, or grade of the masked figure.Used for social control, political action, or the solicitation of contributions and protection, they were danced at important funerals, visits and investitures. 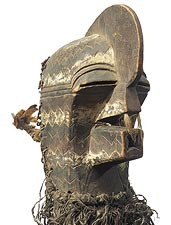 Many of the masks include raffia or full fiber headdresses. 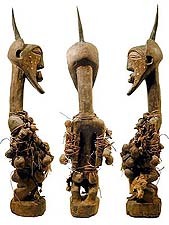 The Songye also made power figures, Nkisi (singular) and Mankishi (plural), to combat witchcraft and sorcery. They were benign and were believed to bring good, promote fertility and success, vanquish enemies and protect from evil. Large ones were owned by and served the community; small ones were for individual families. Adorned with additional objects, Bajimba, with magical properties (horns, skins, teeth, hair, feathers, beads, tacks, cloth, etc. ), they gained their power not from the carver but from the Nganga, or spiritual leader. Their carving was considered secondary to their power. Often too powerful to touch, they were moved with long sticks. Although protective, these are confrontational objects, with a warrior's attitude. 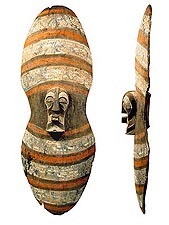 In traditional Africa, shields were used not only as defensive weapons, but also as decorative or ritual objects filled with symbolic meaning. Songye shields are all carved from single pieces of wood. The heads on the shields relate to the masks of this once warlike people from the Dem. Republic of Congo (Zaire) whose art projects an aggressive strength unparalleled in African art.